The incomparable Julia Child once said, “With enough butter, anything is good.” Without question, she is right and butter can make anything better. I had been hearing a lot about a legendary butter sauce for the last few years, but as with so many sauces it has a number of pitfalls. Truth is, the sauce called Beurre Blanc, is nothing more than butter and wine emulsified together into a thick, rich, tangy (incredibly delicious!) sauce. What can you do with this sauce? More importantly — what can’t you do with this sauce? Seriously, you can drizzle it over broccoli, chicken, pork, salmon, or nearly any fish known to man-kind. Heck you could spread it on your toast and wash it down with your morning cup of java. Alright, that might be a little far fetched, but this really goes to show that you can do nearly anything with this sauce. Oh, did I say salmon? Yes! You can apply a tablespoon or two of Beurre Blanc and you will be set to go. This sauce has plenty of depth and richness, especially on a richly-flavored fish such as salmon — that you won’t need more sauce, I promise. Alright, ready to do this? Yeah, me too! Okay, a quick side note, this is an amazing sauce, but this is probably more of a special occasion sauce. Beurre Blanc is an incredible sauce, however, it is very rich. I am a firm believer in moderation, and this is a great example of a not-your-everyday sauce. Place the first 4 ingredients into a sauce pan and simmer over medium-low heat until liquid is reduced by half. Also, the onions and garlic should be soft in texture and very mild in flavor. Slowly start to add the pieces of cold butter (one cube at a time), making sure you are constantly whisking after you add a piece of butter, in order to maintain a smooth consistency. Add salt and pepper and stir until combined. Sauce should be creamy and smooth. Serve immediately. If you notice your sauce is forming any solids, don’t worry, just strain the sauce until you get a smooth sauce. Seriously that is it! Remember, you will want to serve this right away while it is hot, because it doesn’t play nice when it starts to cool. So, I do have photos to share. However, there are only two as the sauce requires constant attention, I don’t have enough arms to stir, add butter, and take the photo at the same time. Alright, here we go! Here is one way to handle this salmon. On a foil plate with olive oil, salt, pepper, dried basil, dried oregano, paprika, and a little brown sugar. Place on the barbecue over medium-heat for about 15 minutes. Remove the salmon from heat, cover with foil, and let it rest for 5 minutes or so. Like beef or chicken, the salmon will continue to cook as it rests, so allowing it to rest will make sure it doesn’t overcook. Oh, yeah, roasted cauliflower too. 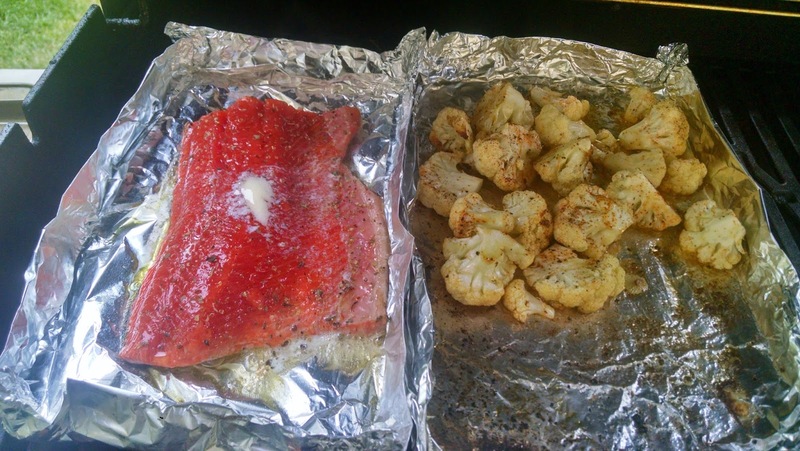 On a foil plate, toss the cauliflower in olive oil, garlic powder, salt, pepper, and a little paprika. Just make sure you mix these around every few minutes so they don’t get super dark and overcook. You should be able to easily pierce the florets with a fork when the cauliflower is cooked through. I wanted to give you a look at the sauce so you can get an idea of the consistency and color. 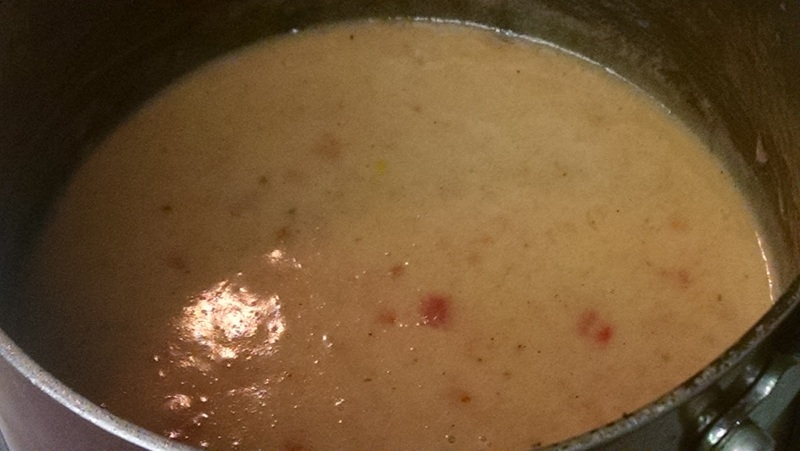 This is what you are looking for with your Beurre Blanc, it is heavenly with that rich, tangy, and thickened mouth feel. Congratulations! You have leveled up to Salmon Beurre Blanc Master!! If nothing else, this sauce is worth having once in my opinion. I had to share this sauce because I was so excited with the complex flavor profile. Having this sauce once may be all you want or need, but if you need to make a splash at a dinner party you cant go wrong with this sauce! The proof is in…well, the sauce.